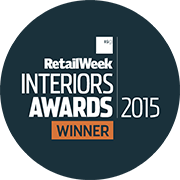 We are thrilled to announce that this project won The Bridgford Interiors Best Large Format Store of the Year at the Retail Week Interior Awards 2015. Their brand’s new 9000 sq ft store was handed to us in a shell state and we immediately set out to create a logical retail layout and customer flow. A mezzanine was introduced to separate out the bike offer from the ground floor swim and run zones along with a café to support the retail offer. New branding was created along with a whole range of bespoke retail systems designed to support different products. As the concept developed we created all of the detailed design drawings and specifications and worked alongside the client and project management teams to support the fit out into store. The retail outlet is now one of the biggest in the UK and is Bristol’s only dedicated Triathlon store featuring an endless pool, a bike fitting studio, gait analysis equipment and a café to support runners and riders for those early morning starts.